Having just returned from Goodwood festival, the duo has completed their newest meticulous crafted recording for Traum. It has been a whole year since their last release on Traum, with a lot of touring to remote parts of the world and building up their new studio, so we expect people to be looking forward to their newest invention. 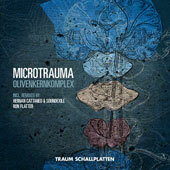 Microtrauma have been a Traum label stalwart since March 2011 with their "Colorblind EP" and the "Olivenkernkomplex EP" maintains both the charm and expert craftsmanship of its predecessors and even adds some new striking perspectives. "Olivia" starts rather simplistic as a dramatic tale and evokes images of early Plastikman trax. Its machine nature in the course of the track swells with organic respiration and makes it a sensuous piece of music that never boils over but simmers on the surface creating a kinetic catchiness par excellence. This is not only a great opener of the track but a very fine blend of stripped rhythms and synth pads. Microtrauma’s strength is the fine balance they create through the knowledge of playing live for years now. Like so many of their tracks in the past also this track has cosmic energy going. Track two features "Olivia" in a remix version by Hernan Cattaneo & Soundexile. The Argentinean electronic music ambassador who is a legend in his time, having being voted to to one of the best DJs in the world by DJ mixmag many years in the row and who is named in the same breath as John Digweed, Sasha, Paul Oakenfold, Henry Saiza and Nick Warren has been a strong supporter of Applescal and Microtrauma from the start and has recorded together with Soundexile this remix of "Olivia". Their interpretation of Olivia has lead to an epic symphony for the senses, changing keys and synth pads with great knowledge for a perfect flow. Creating a perfect balance between beat and melody. Hernan Cattaneo & Soundexile have written a strong remix which will make a lot of people happy and put a smile on their faces. "Cortex" pumps liquid grooves and triggers tiny melodies. Fantastic "stop and go" rhythms are taking place here... synth pads and sub-bass pressure are the matrix of the track... leading it into an exceptional deep and electrifying break. This is a breathtaking break you will very rarely come across… it can connect to the best moments of Klaus Schulze. A goose skin track and a a big one for all people who like to explore the in betweens and the new face of melodic techno. "Inter Aural" is the epic builder for this EP. Their Fx treatments and plenty of teasing climaxes... spitting out futuristic and alienated synth pads… embedding them in soundscapes with a very cinematic sound design: This all makes it a powerful piece of hypnotic music and definitely a highlight on this EP. Other than that it is simply a perfect track to loose yourself in… it offers a highly seductive "comfort zone" of tasty sounds. This is a track you can dance to in the clubs as well as listen at home. Ron Flatter has recently recored his debut for Traum and delivers here a bass heavy techno monster with his remix of "Cortex". The relentlessly bouncing bassline, the nice ups and downs, and the short but intense peaks, create a DJ friendly stop and go rhythmic, making it a DJ weapon altogether. Looking forward to hear they track being played out.